After a day of traveling yesterday, I'm popping in for a minute to wish you guys a merry Christmas! I'm taking a blogging break until the new year, but wanted to share something I whipped up. 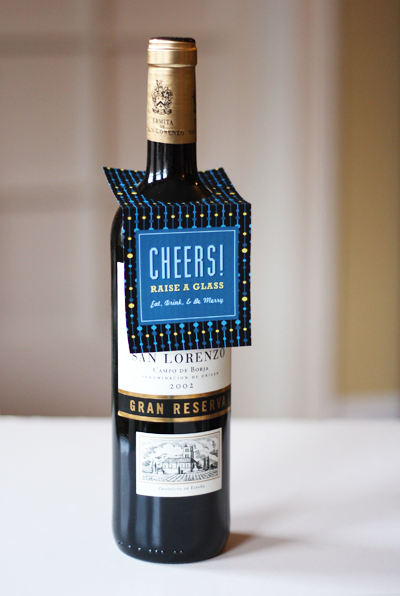 If you plan to give any bottles of wine, champagne, or other festive drinks as gifts, maybe you could use some gift tags. Have a wonderful holiday and a happy new year, everyone! You have read this article design work / downloads / entertaining / printable with the title 2011. 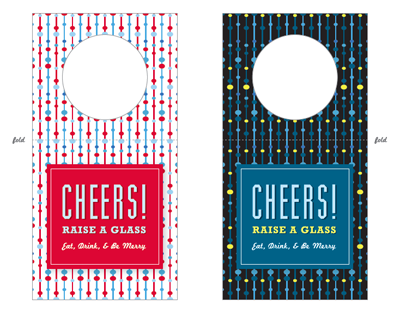 You can bookmark this page URL http://jenkrebs.blogspot.com/2011/12/printable-bottle-gift-tags.html. Thanks! Somehow my gift wrapping session turned into a snowflake cutting session. I wanted to try making some snowflakes that look a little more 3D than the usual version. 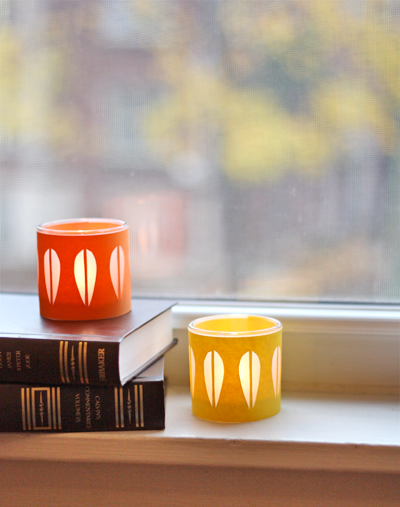 These are made with computer paper, a stapler, double-sided tape, and a scissors. If you've got standard staples that are 1/2" wide, accordian-fold a sheet of computer paper so that the pleats are 8 1/2" wide by about 3/4". If you get to the end of the sheet and have a little extra paper left over, trim it off. 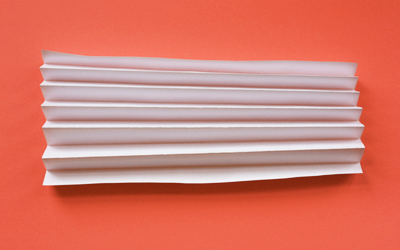 Staple the folded paper as close to the center of the stack as your stapler will reach. Fold the stack in half at the staple and cut off any excess paper from the long side. The staple should now be in the center. 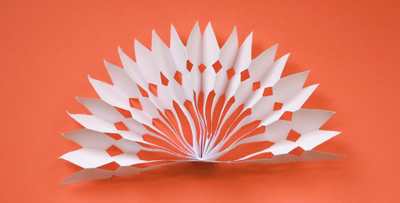 Unless you're using extra thin paper or you have super-human strength, you won't be able to cut through all the layers of paper when the stack is folded in half. 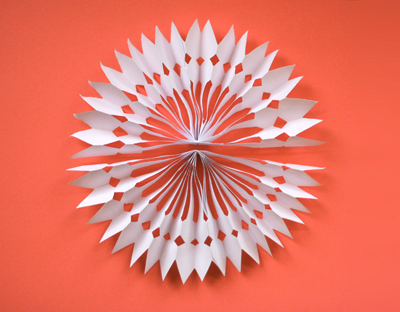 So unfold the stack and cut a snowflake pattern out of one half, then repeat for the other half, duplicating your design. 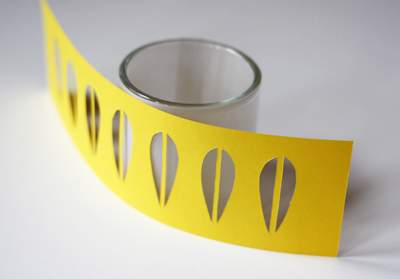 Pull open the accordian folds and join two adjacent ends with double-sided tape, forming a semicircle. 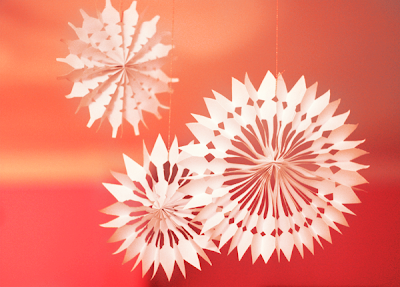 Repeat the process to make the other half of the snowflake decoration, cutting the same design from a second piece of folded paper. Join the two halves together with more tape. 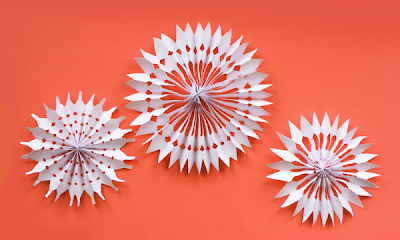 Try making smaller snowflakes from a single piece of paper—put the staple closer to one end of the folded stack and cut more off the other end. You have read this article christmas / paper / tutorials with the title 2011. You can bookmark this page URL http://jenkrebs.blogspot.com/2011/12/diy-paper-snowflake-decorations.html. Thanks! The printables just keep on coming! 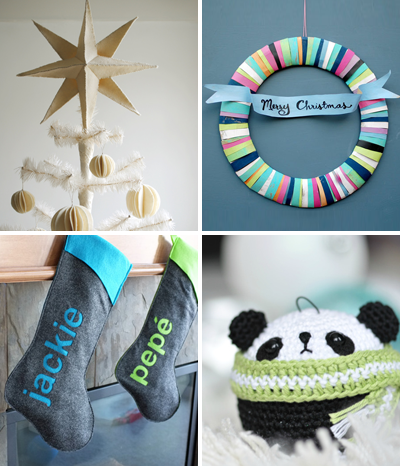 I love Christmas because the internet is bursting at the seams with freebies from generous designers. 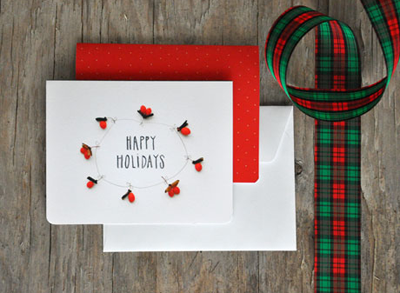 If there's any ink left in your printer cartridge, help yourself to these holiday cards and gift tags. Get the goodies above in two colorways here at Hey Look. Download Camilla Engman's woodland-themed set here. You have read this article christmas / downloads / printable with the title 2011. You can bookmark this page URL http://jenkrebs.blogspot.com/2011/12/and-still-more-christmas-printables.html. Thanks! I like my desktops pared down and minimal. 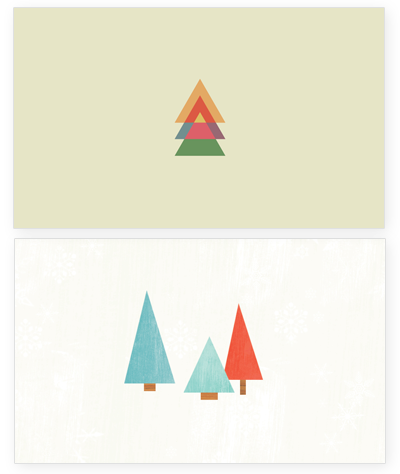 If you do too, grab one of these geometric tree wallpapers. Fetch the first design from Simple Desktops. 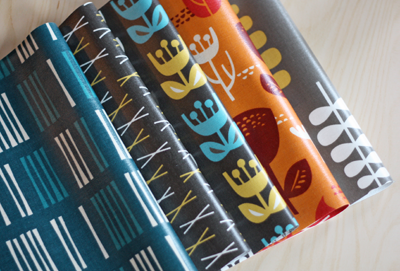 The second wallpaper is from Mufn Inc., part of a 24-day series of Christmas downloads—find them all at Lemon Squeezy. You have read this article christmas / desktops with the title 2011. You can bookmark this page URL http://jenkrebs.blogspot.com/2011/12/simple-christmas-tree-desktop-wallpapers.html. Thanks! 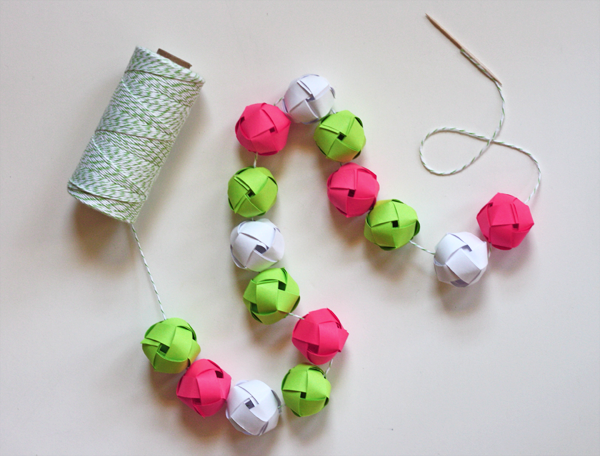 I love paper Christmas decorations, so when I bumped into The Cheese Thief's woven paper ball tutorial, I had to give it a try. They're curiously addicting. Maybe I should carry some supplies with me to pass the time in long check-out lines, boring holiday parties, or during that weird Choreography number in White Christmas. These are made out of paper and one piece of tape. You can cut your own strips (mine are 1/2" wide and 11" long, which yields a ball that's about 1 1/4" in diameter) or use shiny paper ribbon. 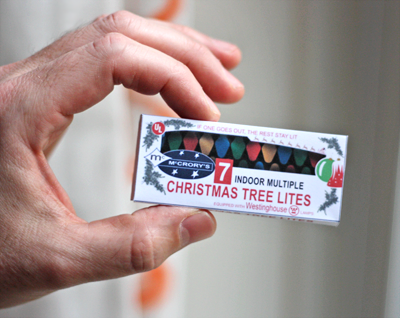 Hang them individually or glue them onto a wreath form. I'm stringing mine on baker's twine to add to the tree. Taping the end of the twine to a toothpick "needle" makes stringing them easier. I plan to space them out along the string, using a dot of hot glue to hold each ball in place where the twine passes through. Get the weaving instructions here! You have read this article christmas / paper / tutorials with the title 2011. 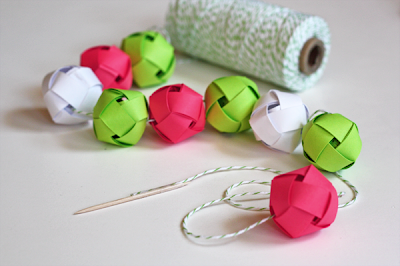 You can bookmark this page URL http://jenkrebs.blogspot.com/2011/12/make-garland-from-woven-paper-balls.html. Thanks! You have read this article desktops / downloads / time-wasters with the title 2011. 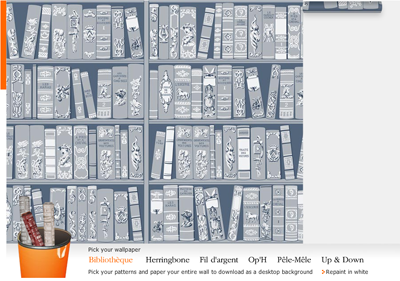 You can bookmark this page URL http://jenkrebs.blogspot.com/2011/12/wallpaper-your-desktop-with-hermes.html. Thanks! Marloes de Vries, a designer and illustrator from the Netherlands, has created a nativity set you can make from paper. Print out either the colored version or a line drawing that kids can color themselves. Then assemble the figures with a bit of glue. Get the PDFs here! You have read this article christmas / printable with the title 2011. You can bookmark this page URL http://jenkrebs.blogspot.com/2011/12/print-and-build-nativity-set.html. Thanks! You have read this article christmas / tutorials with the title 2011. You can bookmark this page URL http://jenkrebs.blogspot.com/2011/12/make-your-own-christmas-decorations.html. Thanks! I see that the Lost Type Co-op has added some new fonts since the last time I was browsing over there. Check out Arvil and Lavanderia in particular. To download them, you can make a donation to the designer in any amount or enter "0" for a freebie. You have read this article fonts with the title 2011. You can bookmark this page URL http://jenkrebs.blogspot.com/2011/12/new-fonts-from-lost-type-co-op.html. Thanks! 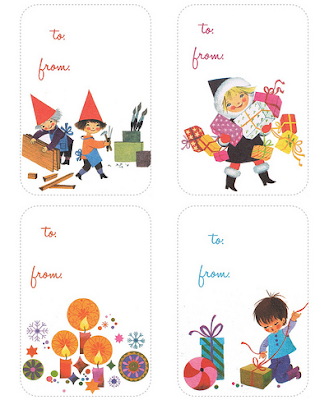 Printable holiday gift tags galore—all free! 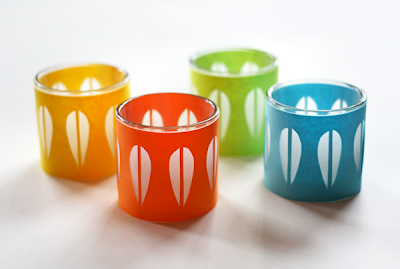 Get Helen Dardik's cheerful 2011 labels here. 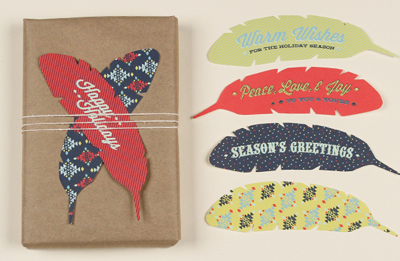 Use feather labels from Love Vs. Design to make your gift stand out. If you live in a mountain cabin, these rustic wood type tags are mandatory. 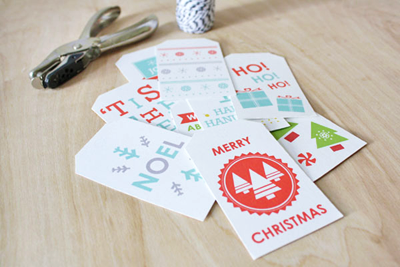 Get an entire Christmas printable kit from Ellinée. 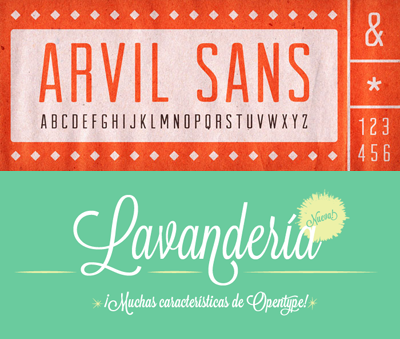 Sass & Peril offers a downloadable set of freebies with crisp graphics right here. For an unconventional color palette, print out these sheets of Christmas labels offered at The Sweetest Occasion, designed by Jen of Blush Printables. You have read this article christmas / downloads / printable with the title 2011. 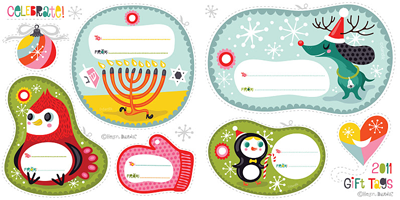 You can bookmark this page URL http://jenkrebs.blogspot.com/2011/12/printable-holiday-gift-tags-galoreall.html. Thanks! Fans of paper folding will admire Francesco Guarnieri's work, including this fantastic fir tree. 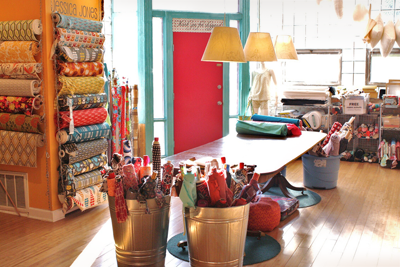 Sara Adams of Happy Folding demonstrates how to make it right here. So lovely! You have read this article christmas / origami / paper / tutorials with the title 2011. 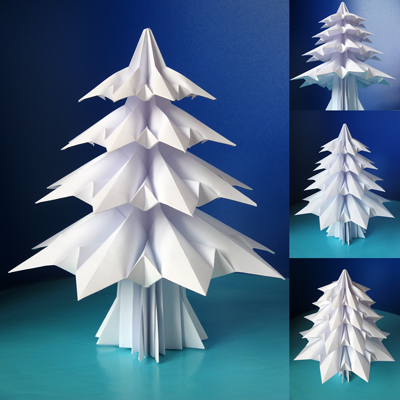 You can bookmark this page URL http://jenkrebs.blogspot.com/2011/12/how-to-make-origami-christmas-tree.html. Thanks! I added some more DIY ornaments to our Christmas tree. I'm having trouble adjusting to the thought of winter; can you tell? 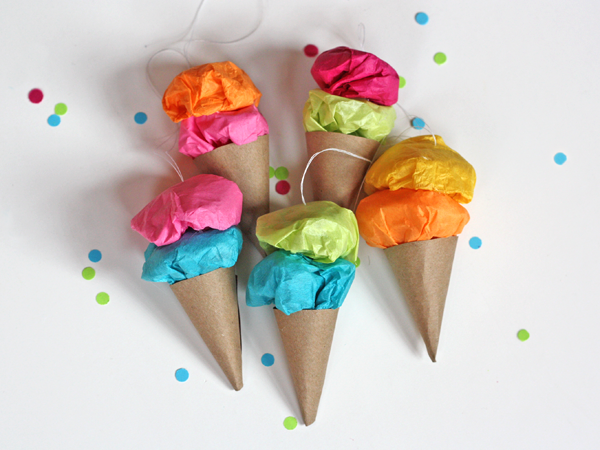 These ice cream cones are made from tissue paper and a grocery bag. 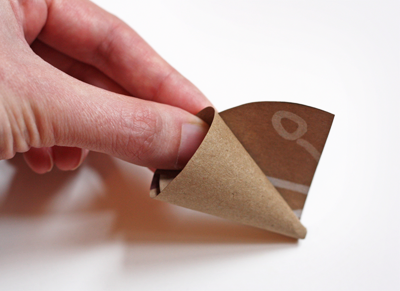 To make the cones, cut circles from a brown paper bag. Mine were about 4 1/2 inches in diameter. Cut each circle in half. Shape the semicircles into cones, cutting off any extra paper you don't need (the section that's sticking out in the photo.) Secure the cone with hot glue. Wad a couple pieces of tissue paper into balls. I used chunks that were roughly 6" x 12", folded them in half, and crumpled them up. 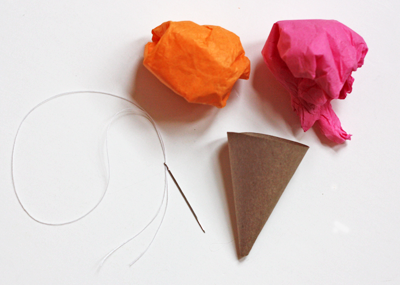 If you plan to hang the ice cream cones, thread a needle with a doubled piece of thread. Poke the needle down through the top of the ball that will be the top scoop, so that a loop of thread sticks out of the top. Secure the loose ends on the underside with a dab of hot glue and trim off the excess. Line the inside rim of the cone with hot glue and push the bottom scoop into the cone. Spread glue on the underside of the top scoop and add it to the cone. 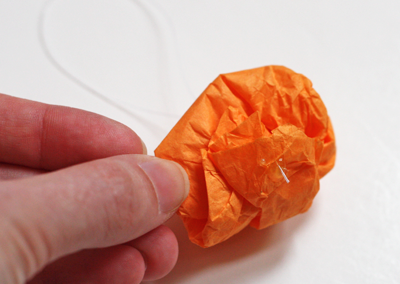 Let the glue dry for a minute and hang it on the tree. You have read this article christmas / paper / tutorials with the title 2011. 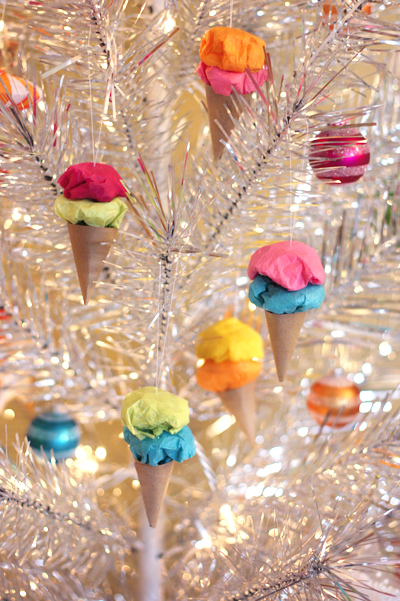 You can bookmark this page URL http://jenkrebs.blogspot.com/2011/12/easy-paper-ice-cream-ornaments.html. Thanks! Planning to send some quick Christmas greetings? Download printable postcards by Alison Owen right here, featuring the font Skunkling. 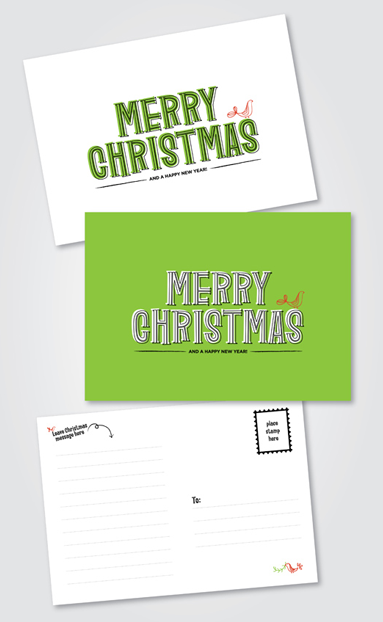 You have read this article cards / christmas / downloads / printable with the title 2011. You can bookmark this page URL http://jenkrebs.blogspot.com/2011/12/printable-christmas-postcard-freebie.html. Thanks! I'm pleased to announce that my new-and-improved portfolio website is up and running! Blogging here at How About Orange is a fun side project, but the majority of my work is graphic design for businesses: logos, brochures, various sorts of marketing materials. My old site was tricky for me to update since I don't know much about coding, and it needed to be more informative for prospective clients. You have read this article design work with the title 2011. 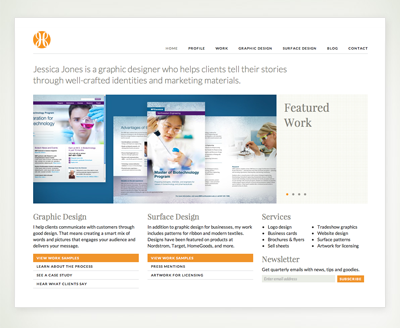 You can bookmark this page URL http://jenkrebs.blogspot.com/2011/12/meet-my-new-portfolio-website.html. Thanks! If you like nostalgic Christmas graphics, you'll get a kick out of these tiny Christmas boxes from artist Jason Snyder. One set is designed to look like vintage boxes of lights from dime stores, while other sets feature old-fashioned gift wrap. Get them here. And you likely need some retro gift tags for your presents. If so, grab some of these freebies from My Girl Thursday. You have read this article christmas / downloads / printable with the title 2011. 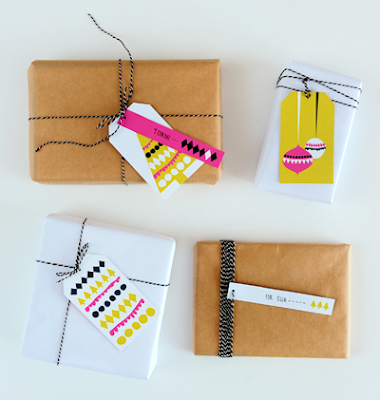 You can bookmark this page URL http://jenkrebs.blogspot.com/2011/12/retro-printable-christmas-boxes-and-tags.html. Thanks! You have read this article design work / fabric with the title 2011. You can bookmark this page URL http://jenkrebs.blogspot.com/2011/11/outside-oslo-is-available-laminated.html. Thanks! 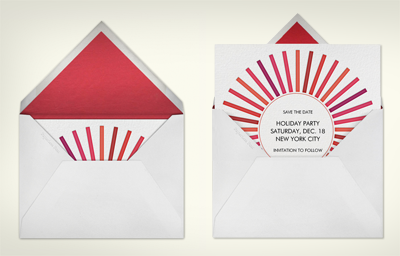 I've used Paperless Post in the past to send elegant electronic party invitations and birthday cards. I like the way many of the designs look letterpressed on textured paper. 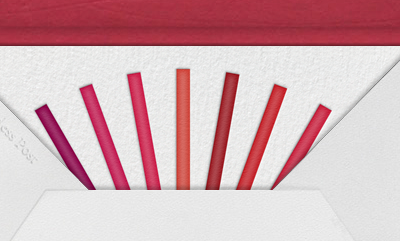 Plus you can customize the typography and add coordinating shiny envelope liners for extra fun. When recipients click the envelope that arrives in their email inbox, a lovely card emerges. Check it out! I found one that coordinates with my Fireworks fabric. Apparently I need to plan a party that includes this invitation and a big tablecloth. I'd look so put together. This season there's a new line of holiday invitations, photo cards, and greetings that won't cost you anything to send. Check out the freebies here, or browse the entire collection here. 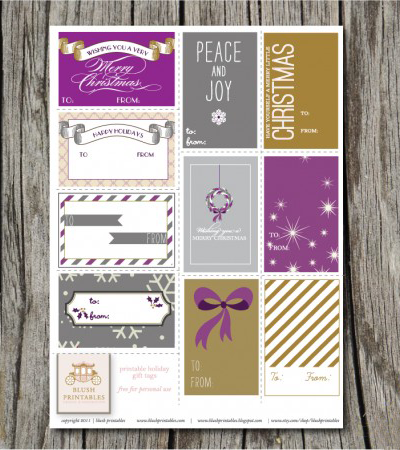 You have read this article cards / christmas / invitations / resources with the title 2011. You can bookmark this page URL http://jenkrebs.blogspot.com/2011/11/letterpressed-e-cards-from-paperless.html. Thanks! You have read this article christmas / downloads / paper with the title 2011. 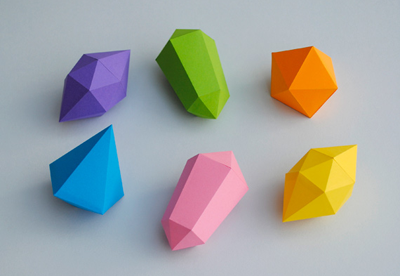 You can bookmark this page URL http://jenkrebs.blogspot.com/2011/11/paper-gem-christmas-ornaments.html. Thanks! Happy Thanksgiving, everyone! 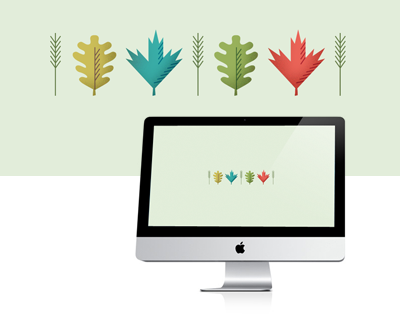 I'm signing off for the week but leaving you with some leaf-themed desktop wallpaper in honor of the holiday. I like functional wallpapers that make it easy to find files, so this is a simple one. Download a 2560 x 1600 file right here. Enjoy your weekend! 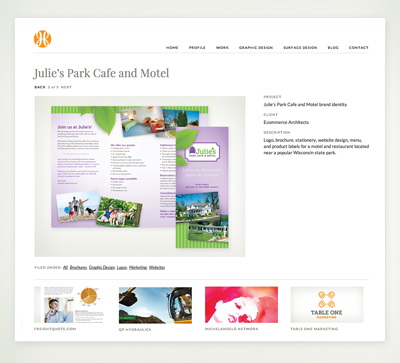 You have read this article design work / desktops with the title 2011. You can bookmark this page URL http://jenkrebs.blogspot.com/2011/11/fall-desktop-wallpaper-freebie.html. Thanks! You have read this article decorating / paper / tutorials with the title 2011. 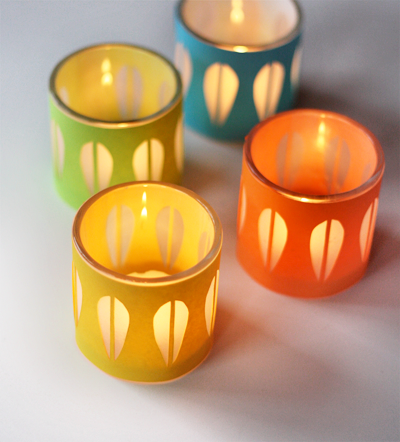 You can bookmark this page URL http://jenkrebs.blogspot.com/2011/11/diy-cathrineholm-candleholders.html. Thanks! My mom, known to you guys as frequent commenter Grandma G, just finished sewing up a Bucket Bag from Keyka Lou's PDF pattern. 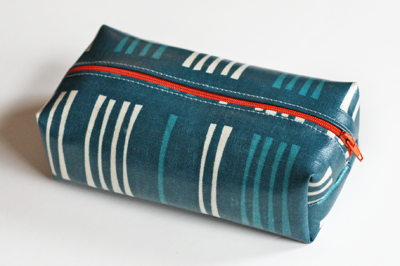 She used Skiff in Dawn from my Outside Oslo fabric collection and lined the bag with some Artee cotton duck in Turquoise. The pattern has an oval bottom, so it really is sort of like a bucket—a cute one with a big pocket on the outside and a nicely proportioned strap. Mum added a magnetic snap since a closure is always nice. And I love the button with its coordinating scallops. My niece Courtney, who creatively modeled the bag after Mum finished it, stated that the fabric looks like trimmed fingernail bits. Excellent. Exactly the look I was going for. 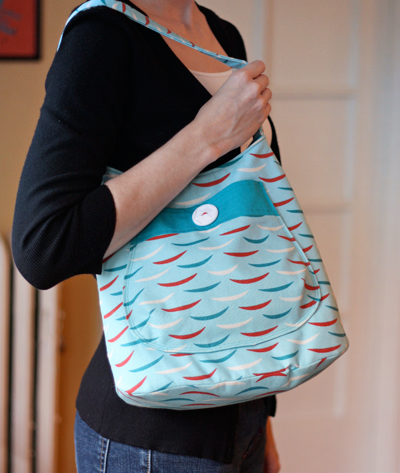 "It was a pleasure to sew a bag from a pattern that didn't have me tearing my hair out because it was so complicated! I really enjoyed making this bag. The instructions were very detailed, yet clear and easy to follow in a numbered, step-by-step format, with photos to illustrate every step. I would highly recommend this pattern for anyone just beginning to make bags. It'll get you started in the right direction and you'll learn a lot about the bag-making process. 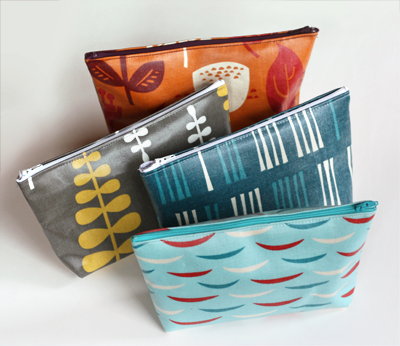 I'd also recommend it for more experienced bag makers, just because it's easy and fun! And no matter your skill level, you'll end up with a very cute bag. I love the shape of it as well as just the overall look. The next time I use this pattern, I'll probably add a pocket or two inside. Also, I might skip the darts on the outside pocket, because unless something is stuffed into those dart areas, they tend to have a dented/dimpled look (kinda like a bra that's not quite filled out, y'know?). I'd trim the pattern piece so that it remains the same shape, just minus the darts." 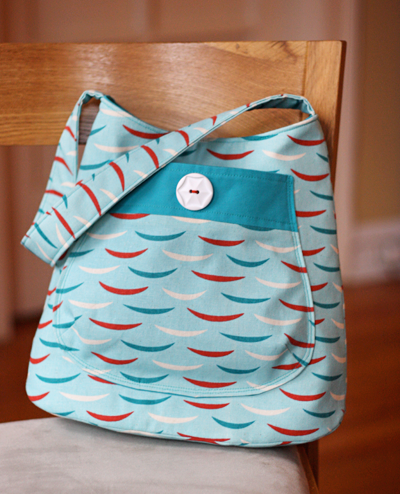 Purchase the Bucket Bag pattern right here, and check out other Keyka Lou designs here. All patterns are available for instant download, and most are a mere $5.00 through 11/27/11! 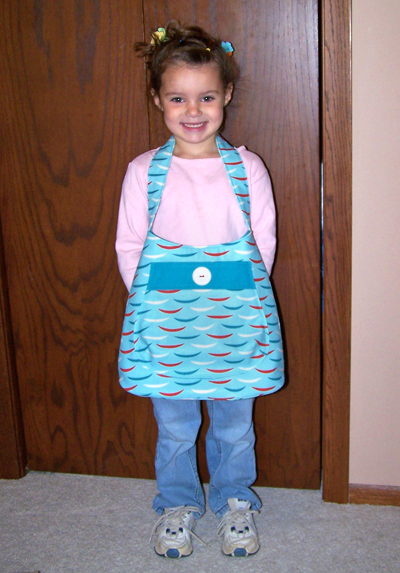 You have read this article bag / design work / pattern review / sewing with the title 2011. 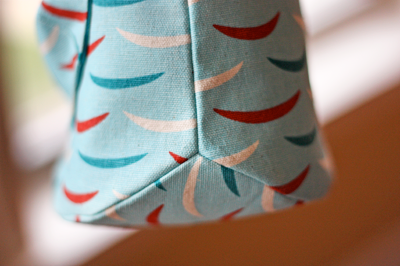 You can bookmark this page URL http://jenkrebs.blogspot.com/2011/11/pattern-review-bucket-bag.html. Thanks!